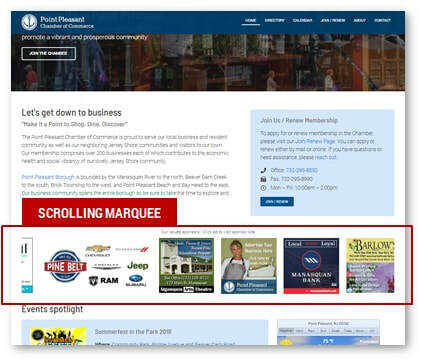 ​Your membership in the Point Pleasant Chamber of Commerce entitles you to advertise your business on the Chamber website home page (this is in addition to your automatic listing in the Member Directory). This opportunity is available only to Chamber members and we offer advertising rates that are highly competitive with other media. If you require assistance with a web ad or with your business branding, we can refer you to local area graphic designers with expertise in this area. Please review the following ad rates and specifications and feel free to Contact Us for additional information or to secure a space on the website for your business advertisement. Please note that we have a limited number of ad spaces and each space is purchased on a first come, first serve basis. Immediately beneath the home page “Let’s get down to business” introductory section, is an auto-scrolling marquee of roughly 2" x 2" square ad spaces. We limit the number of ads in this space to maximize the exposure of all advertisers on most desktop screens (~14" diagonal and higher). On mobile devices, the scroll traverses all six spots in approximately 7-8 seconds. Each ad is linked to the advertiser’s website and ads are displayed in randomized order (different order each time the home page is newly visited or reloaded). On the desktop, the marquee auto-scroll (right to left) can be accelerated, slowed, paused, or reversed depending on where the mouse is hovered (accelerate by hovering on the right side of the marquee, slow/pause by hovering at or near the center of the marquee, reverse by hovering on the left side of the marquee). An existing ad can be replaced during the year for an additional fee of $25 per replacement. 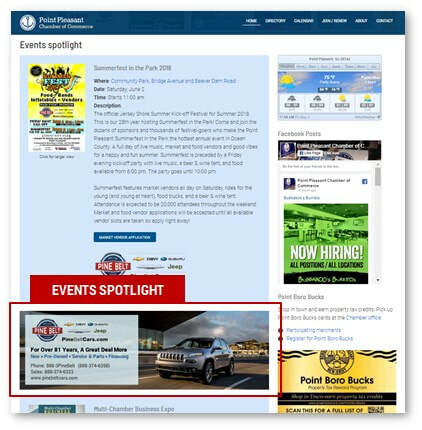 The Spotlight ad is located immediately beneath the first event call out box in the “Event Spotlight” section of the home page. The spotlight ad is linked to the advertiser’s website. An existing ad can be replaced during the year for an additional fee of $125 per replacement. Please note that we have a limited number of ad spaces in each available site location and each space is purchased on a first come, first serve basis. If you require assistance with your company's web ad or with your business branding, we can refer you to local area graphic designers with expertise in this area. You can provide us with any sized, roughly square-shaped ad and we will scale it down as needed. Please remember that if we scale an existing ad down to the required size, it is possible that some text may become illegible if the original ad is quite large so it’s best to start with a smaller ad if possible. We’ll advise you if your scaled-down ad is suitable or not. ​Tip: Less is more! These ads are relatively small and you should keep the ad content to the essential minimum (slogan, phone number, address). If you start with a large ad with roughly the right (square or rectangular) aspect ratio, it may appear perfectly readable at that larger size. However, if you shrink the ad to the required ad spot size, your text will shrink too and may become illegible if you have too much text in your ad. So keep your ad content short and sweet! Ads are linked to your business website so you don’t necessarily have to include your website address in your ad.